July 9, 2014 - Like us now! 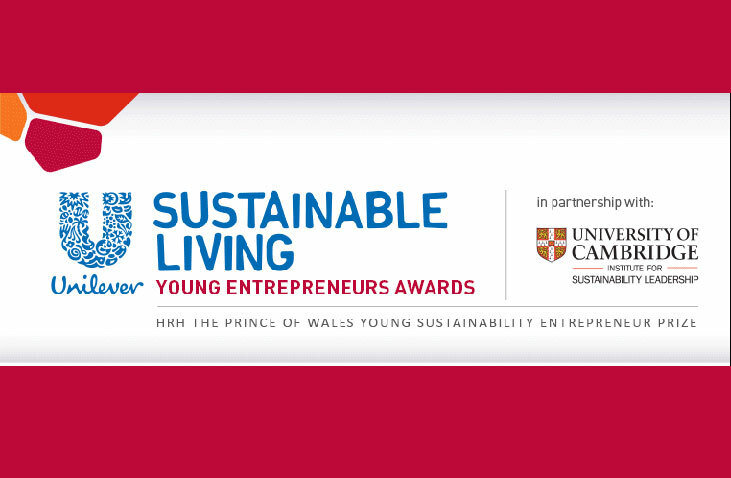 As part of Unilever’s Sustainable Living initiative, the multinational giant has launched the Young Entrepreneurs Awards 2014 in partnership with with the University of Cambridge Institute for Sustainability Leadership and in collaboration with Ashoka. The program aims to honor young and aspiring entrepreneurs who have come up with product, application or service in the area of sustainable living that could reduce environmental impacts, improve health and well-being or enhance livelihoods through changes in practices or behaviors. Seven winners will be entitled to a total of more than €200,000 in financial support and case based mentoring whereas the overall winner will also receive the HRH The Prince of Wales Young Sustainability Entrepreneur Prize. More details regarding each of the categories can be found here. Last year seven finalists were selected out of 510 entries from 90 countries in similar categories as this year. A list of last year’s entries can be found here for inspiration. So far the competition has seen only a handful of entries from Pakistan (check out the Changemakers page for a list of all the current entries by geographical location) and while Pakistanis were unable to gain any merit last year, maybe this year things will be different and we will be able to showcase our impressive talent to the world. The deadline to apply is the 1st of August, 0400 PST.